One of my favourite places to hang out in during a rainstorm is a cozy pub with a roaring fire. Not the answer you were expecting on a bookshop blog? My other favourite place to escape the rain is a bookshop. Not only did this week's bookshop offer me a cosy sanctuary from torrential rain, it also came with tea. Found in Oswestry, on the Welsh border, it appeared Booka Bookshop must be used to welcoming damp or drenched customers, as I was greeted by a row of colourful umbrellas just inside the door. The pale shopfront had been a bright welcome on the drizzly day of my visit but I imagine even on sunny days this is a welcome place to visit, whether to browse for books or simply catch up with a friend in the cafe. As the cafe area was full – and if I'm honest that wasn't my priority anyway – I began my visit among the books. Everywhere felt light and summery, even though it was a dull day outside, and the gentle buzz coming from the cafe and other browsers gave the whole room a very friendly atmosphere. Which is quite an achievement in a shop as large as this. The comfy cafe area alone took up the space of your average medium-sized bookshop, with roughly another two thirds of room dedicated to books and gifts. My priority was the books but I also enjoyed the randomness of a shelf full of alarm clocks, and there was lots more to tempt should you for some reason want to buy things other than books. 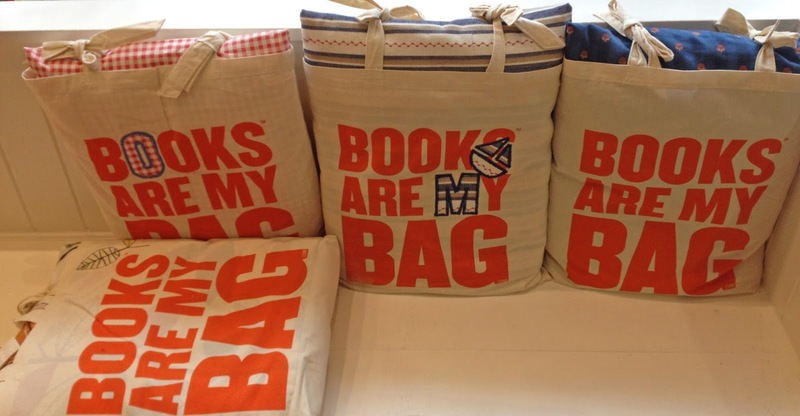 This bookshop is also packed with interesting details to catch the eye and make you smile – including these rather lovely Books are my bag tote cushions. I dithered for some time over my choice of purchase as I made the most of the mix of all genres combined together under the one bracket of fiction. The way this enables and encourages browsers to leave their comfort zone and discover a wider range of fiction than they would perhaps ordinarily be used to is a big plus in my eyes. It also meant I was drawn to a title I'd not previously considered: Annihilation by Jeff VanderMeer. Having bought my book I checked the status of the weather – still raining – and returned to the cafe just as a table came free. Somehow able to resist the delicious array of cakes on display (I can't have been feely well that day), I settled down with my new book and a pot of tea. 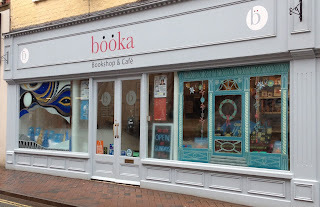 The rain was still flowing when I finished my chapter and drank the last of my tea, but the warmth and friendliness of Booka Bookshop had set me up for the day. PS. My apologies to Booka Bookshop, as they'll know from the window display, it's some time since this visit took place. No disrespect is meant by the delay in sharing this lovely bookshop, other events just got in the way. PPS. 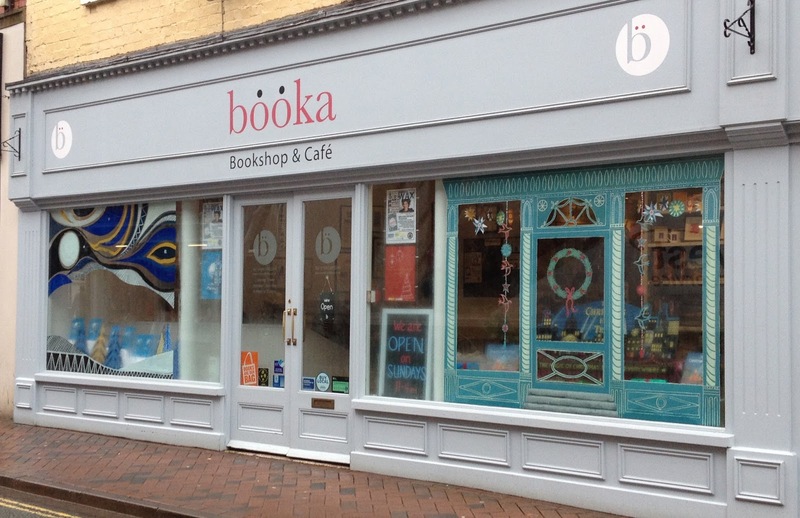 Don't just take my word for it that Booka is great, here's a guest post about the bookshop.